Samsonite is one of the top manufacturers of luggage, and they’ve been at the top for a while. They manage to stay there because they make luggage that is of high quality, and that can last you years. Today we’ll take a look at the S’Cure Spinner, a relatively new addition to their wide range of luggage. The S’Cure is a large hardshell suitcase, and it is the perfect option for longer trips, as you’ll see below. 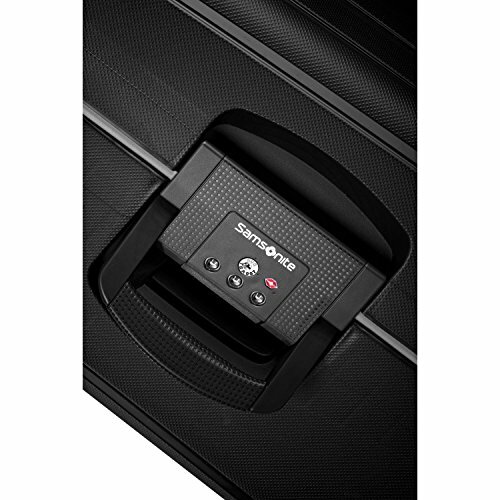 Scroll down to find out all you need to know about the Samsonite S’Cure Spinner, and whether or not it is the right choice for you! Is The S’Cure Spinner Worth It? Sizes: 28.5" x 18.0" x 11.5"
The S’Cure Spinner is made of a new, revolutionary polypropylene material that is called Flowlite. This material is incredibly lightweight, but also very durable. The shell of the suitcase is, therefore, incredibly strong and resistant to pretty much anything. And it is really easy to clean, which is something I always look for in luggage. The suitcase also has a rubber frame gasket. This was integrated into its build in order to make the suitcase as waterproof as possible. The rubber gasket also repels any dirt and moisture that tries to get into your suitcase, so you can have some peace of mind knowing that your possessions will stay dry and clean no matter what. In terms of design, it isn’t the most stylish suitcase ever, but it looks okay. It has a matte finish with a dot pattern on the front, and also the classic Samsonite logo in the middle. Overall, there is nothing really special about the design of the suitcase, but Samsonite made up for that with the color variety. You can get the S’Cure Spinner in 3 (currently in stock) different colors, but I have to single out the Dark Blue version. The S’Cure Spinner is a zipperless suitcase. If you are not really familiar with zipperless luggage and its benefits, check out our review of best zipperless luggage. This suitcase features a 3-point locking system. The main lock is TSA approved, which is great for anyone who frequently flies to the United States. It’s also a combination lock, and you can easily set it up yourself. Apart from the combination lock, there are also several latches on the sides of the suitcase. The latches are there to further ensure the safety of your stuff, and they cannot be opened before the main lock, naturally. The S’Cure Spinner has spinner wheels, but you probably already guessed that. What this means is that each wheel turns 360 degrees, which provides you with optimal maneuverability of your suitcase. In theory. In reality, the wheels don’t appear to be that great on this suitcase. They do serve their purpose, especially if you haven’t packed a lot of things. If you’ve packed the S’Cure Spinner to its maximum capacity, then you will have some issues. The wheels don’t roll as smoothly when a lot of weight is put on them, and you will especially have a problem with getting it to turn corners. However, if you’re a bit luckier, you might not have any issues with the spinner wheels. A lot of people didn’t have any problems with the wheels, so it really depends. In any case, Samsonite offers 5 year warranty on the S’Cure Spinner, so if you do find the performance of the wheels unsatisfying, you can always have them fixed. The S’Cure Spinner has handles on the top, bottom and sides. So, feel free to carry it sideways or upside down if you want to, for some reason. The main telescopic handle can be extended and locked to three different lengths, so you can set it up to fit your height best. 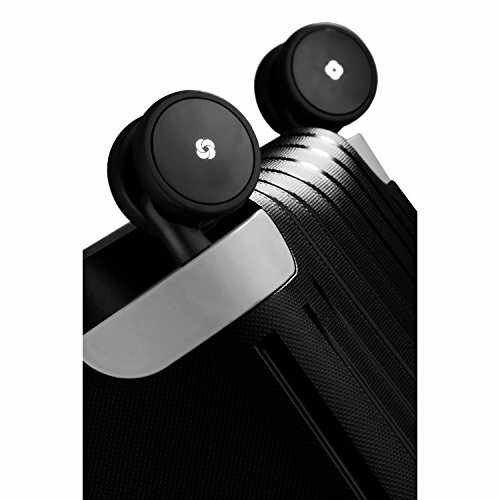 The handles are made of aluminum, and so are the tubes from the telescopic handle. They are very lightweight, but also really strong. Aluminum is a sturdy material, so you don’t need to worry about a handle accidentally breaking off in your hand. The S’Cure is quite minimalistic both on the outside and on the inside. It has the top and bottom compartments, and that’s pretty much it. There’s no lining, which I think is a bonus, because it gives you even more packing space. And, if you accidentally spill something in your suitcase, you can clean it up in no time. There is just one additional pocket in the suitcase, and it is in the bottom compartment. There are also the elastic straps in the bottom part, and a divider in the top part. The divider can be zipped up, which is a plus. Personally, I prefer zipped dividers to those with hooks, because hooks can get undone accidentally. Let’s go back to the elastic straps in the bottom compartment. They are positioned quite high, which could cause you some headaches. They won’t do their job if you pack only half of this compartment, and your clothes will inevitably get jumbled up. This is a very large suitcase, so the straps won’t bother you if you do a lot of travelling, and plan to fill up the S’Cure to the brim. If you need something to take with you on shorter trips, check out some of these suitcases. Overall, yes it is. It is a great choice for people who go travel a lot and need a big suitcase. With storage capacity of 102L you can comfortably pack for a 2-week vacation, and there will still be room left. It’s lightweight and incredibly durable, and it should last you many, many years. And, it also comes with a 5-year warranty. It’s not really a cheap suitcase, but you will get your money’s worth. You shouldn’t even consider it a suitcase; consider it an investment. You will spend a bit more on the S’Cure, but you’ll save money in the long term – this one is so durable that you won’t need to buy another suitcase for a very long time. On the other hand, if you don’t really travel often, or if you rarely travel for longer than 4-5 days, then I wouldn’t say that this is the perfect fit for you. Again, it’s a very large suitcase, and it makes no sense to get it if you’re only going to fill it halfway. 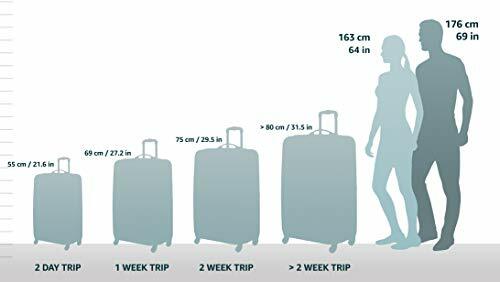 In this case, I suggest you check out our review of the best underseat carry-on luggage – it’s the best option for those who pack lightly. 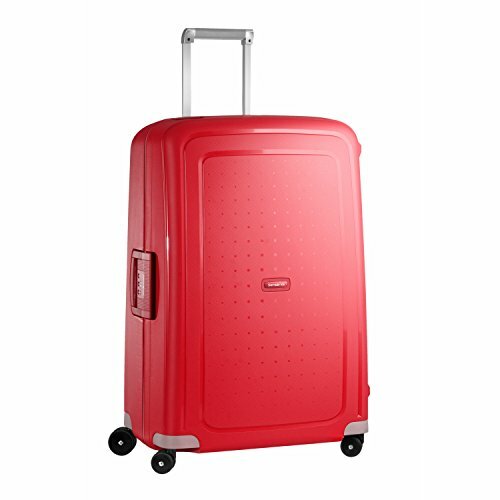 Anyway, head on over to Amazon to get an excellent deal on the Samsonite S’Cure Spinner!